In the joint college meeting last Thursday, there was a lengthy discussion of some of the implementation questions surrounding Grand View’s new plus-minus grading system that will go into effect this Fall. During the discussion, a couple folks had questions about how Blackboard’s gradebook could be tweaked to reflect the new plus-minus scales that we implement in our classes. 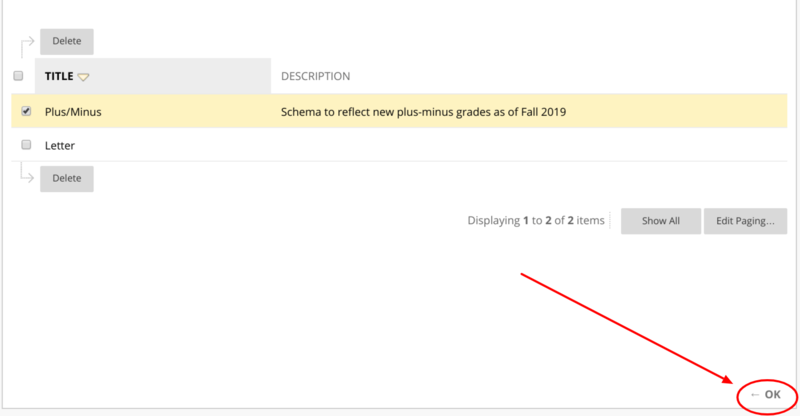 As promised, here is a quick overview of how you can use the “Grading Schema” feature of Blackboard’s gradebook to create a custom scale for students to see the letter grade equivalents for their percentages that you enter in the gradebook columns. First and foremost, it’s worth noting that using the grading schema tool is a way to maintain clarity for our students, so that they understand what the grade equivalents are for their numerical scores. But to avoid confusion, we should be making it a priority for our grading scale to be explicitly and thoroughly presented in our course syllabi. A syllabus that doesn’t contain an explanation of how students will be graded, and what the criteria are for specific course grades (including what counts as an A, A-minus, B-plus, etc.) is incomplete. We are ethically obligated to be clear and consistent with the ways in which we grade our students. And in a more practical sense, any measure we take to cut down on potential confusion and frustration is something worth doing as well. You’ll then be taken to the “grading schema” page, where you can select a schema to apply to your course. But in order to do that, you’ll need to create your schema first. 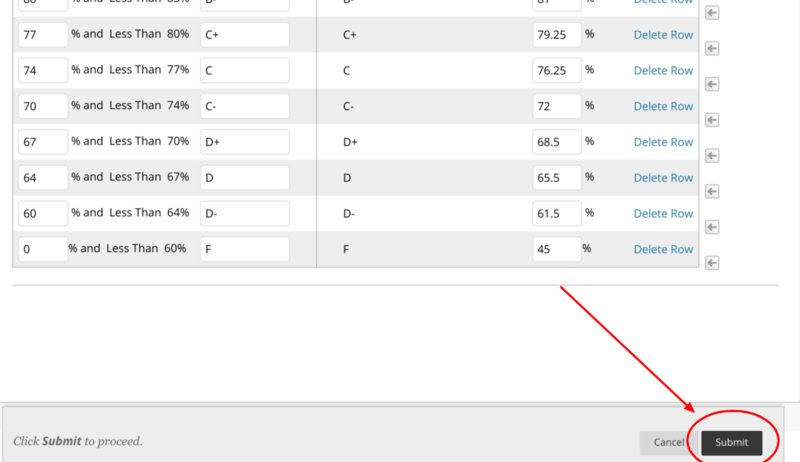 So click on the “Create Grading Schema” option to the above left of the page. Once you create a schema, it will be available to select on this landing page in the future. And you’ll then map the schema, which means entering the percentages which will be represented by a particular letter grade. When you use the schema in your course, you have the capability to display both numerical and letter grades for your students. For example, if you have a 20-point assignment, students will see their grade both as a score out of 20 (i.e., 16/20 points), as well as a letter grade corresponding to the percentage represented by that score (so, in this case, 16 out of 20 is 80%, or a B-minus, according to the schema I’ve created below). When you first get this page, there are only two rows present by default. To add rows, click on the arrows at the far right; make sure you click the appropriate one for the location of your new row. If you mess up, you can always delete the row by clicking “Delete Row” on the right. When you’ve finished creating your schema, don’t forget to hit “submit” at the bottom of the page! 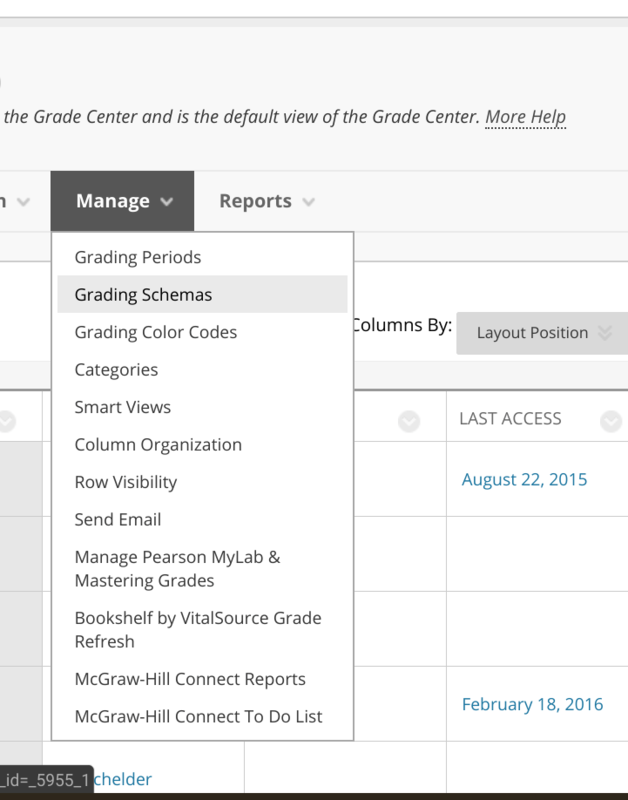 Once you submit, you’ll be taken back to the Grading Schema page, where you’ll now see the schema you’ve created. You can apply it to your gradebook by checking the box next to it, and then clicking “OK” at the bottom right corner of the page. And that’s how you create a grading schema. 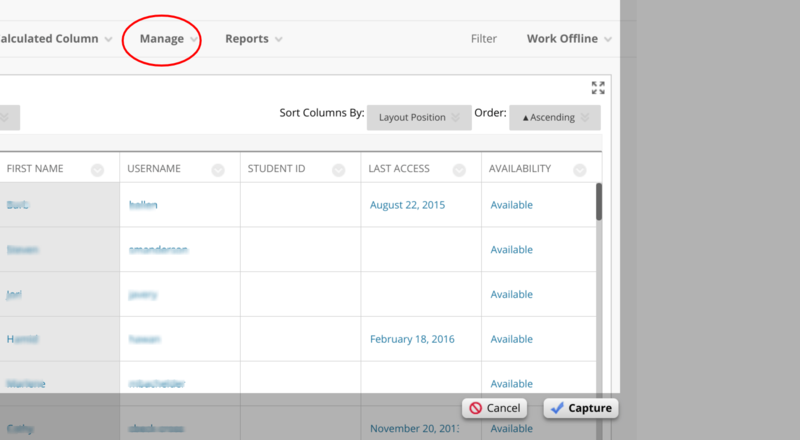 You can use the column editing features in the grade center to control how grades are displayed (primary display, primary and secondary, etc.) to your students. As we transition into plus-minus grading, Blackboard tools can help keep the process clear and visible for you and your students. And as always, the CETL staff is happy to assist with this, or any of Blackboard’s other tools. Simply call or come by the CETL to ask any questions. You can also email our Blackboard Administrator, Tiffany Morlan, at tmorlan@grandview.edu or the CETL Director, Kevin Gannon, at kgannon@grandview.edu. Let us know how we can be of service!